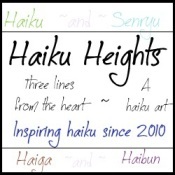 This entry was posted in Haiku and Related Forms, haiku heights prompt and tagged breeze, haiku. Bookmark the permalink. Me, too–love those fresh, impertinent faces they have. Glad you liked this! I hear the longing for sun and flowers in this. Oh, yes, but I will settle for the ice flowers I’ve been given. Beautiful, delicate and dare I say it… sweet!? Haiku perfection. SORAYA!!!!! You can call it anything you want, I am so glad to see your comment! What will nod daisies… love. Thanks, Nelle. I am ready for them! snow, confetti, white flowers, you’ve captured a spring breeze wonderfully Susan, though I can’t wait for colour. Oh, me too! Thanks for liking this one. I enjoyed the beauty splattered here.. thanks for the delight Susan!!! “what will nod daisies” awesome line! you’re magical under a microscope ~gorgeous ! Bjorn, thank you! A little tricky to squeeze that into a haiku, but fun when it works. Oh, so glad you enjoyed! Everything’s coming up DAISIES in your haiku. very light hearted like ushering in spring.